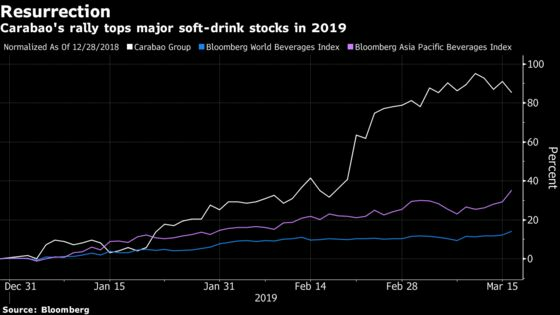 (Bloomberg) -- Red Bull competitor Carabao Group Pcl is once again the world’s top performing soft-drink stock after rebounding from a record share-price slump last year. A recovery in earnings helped catapult the Thai stock past the likes of Monster Beverage Corp. and PepsiCo Inc. with a total return of 91 percent, according to data compiled by Bloomberg. The surge is the biggest globally in 2019 among soft-drink makers with a market value of at least $1 billion -- and steep enough for some analysts to sound a note of caution. "It’s time for the company to deliver promised growth before the stock can rally further,” said Chaiyatorn Sricharoen, an analyst at Bualuang Securities Pcl in Bangkok. "The current share price is already near its earnings potential." Carabao is named after one of Thailand’s most successful rock bands, whose buffalo-head logo adorns the energy drink. Chairman Sathien Setthasit is counting on rising demand internationally, such as in Cambodia and Myanmar, for sales growth. The drink, which outsells Red Bull in Thailand, surged following its listing in 2014 before the cost of expanding in China and the U.K. weighed on the shares last year. Chaiyatorn has a buy rating on Carabao with a share-price estimate of 61 baht, according to data compiled by Bloomberg. The average consensus 12-month price estimate is 51.15 baht, compared with Tuesday’s close of 57.75 baht. Most investors have been “too optimistic” about the 2019 sales outlook, said Theethanat Jindarat, a Bangkok-based analyst at Yuanta Securities Co.
Net income more than doubled in the October-December quarter to 513 million baht ($16 million). Sathien, whose net worth is $648 million according to the Bloomberg Billionaires Index, didn’t return calls to his office seeking comment on prospects.